What One Question are you striving to answer today? There are men who live a more focused life than others. For some people, everything they do revolves around one issue, one problem, one goal, or one purpose. I admire those people; people who fundamentally change the way the world thinks. Wes Jackson (1954 graduate of Seaman High School, my high school) is one of those men. The problem that he is working on can be described like this: soil is a non-renewable resource that is being exhausted every time a plow is taken to ground. Wes would argue that our dependency on farming over the last 10,000 years has led to our fossil fuel dependency, global warming, and overpopulation. The second issue is that our current crop production and yields are not enough to keep up with our ever-increasing world population. We will need to double the amount of crops and yield by 2050. Wes Jackson and his Land Institute has made it his mission to solve both of these issues in his lifetime. 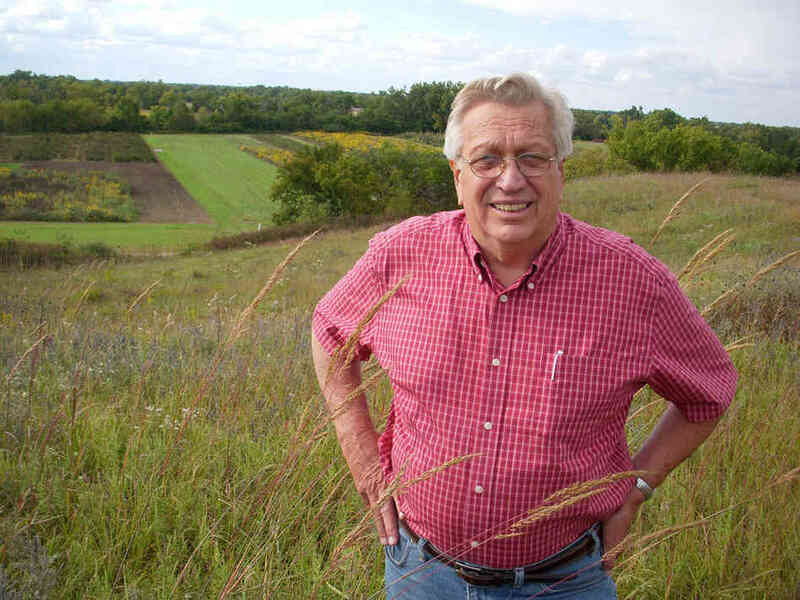 Starting in 1976, Jackson set out to pattern crop production after the prairie. Looking at the way the prairie sustains its self and is constantly producing, Jackson wanted farming to take those patterns and emulate them. For almost forty years now, he has been working on cross breeding grains and crops in order to remove the plow from our farm lands. By looking for the genes that provide for great annual yields and genes that cause plants to grow perennially, he can protect farmland from run off, emissions from tractors, and soil loss due to plowing. For 40 years now, Jackson has pushed forward farming and agriculture around the world because of his research. Hybridizing and crossing different types of crops…and you thought your job sounded fun. I wonder how many kids want his job when they grow up. It may not be exciting, but Jackson is a plodder. He knows his purpose, he is committed to his work, and he wakes up every morning devoted to finding an answer. Moses life goal, his purpose arrives to him when he is 40 years old (Acts 7.23) and he becomes Wes Jackson. But what was he in the 80 years prior? He certainly wouldn’t be a jr. achievement advisor. After 40 years of being taught the history of Egypt and the knowledge of the greatest civilization on earth at the time, a possible heir to the throne of Egypt, he threw it away by killing an Egyptian and fleeing his own people to Midian (Acts 7.23-29). Midian wasn’t a destination place; it was a choice of exile for Moses. Midian was where Moses went to forget himself. The next 40 years was spent as a shepherd, learning to lead a group of really dumb animals, and learning all the things that the school of Egypt didn’t teach him. Now at 80 years old, an ordinary bush became the kick in the pants for Moses. I admire people like Jackson and Moses; men who devote their lives to solving problems, creating solutions, and leading those around them to do the same. But often times, I find myself where Moses was in the desert chasing sheep; nothing seems to be moving forward, nothing seems new. The future is so far away, and nothing was built on the past. I wonder if Moses ever felt like the pause button was hit on his life (he didn’t even know what a pause button was!)? I wonder if he enjoyed his anonymity? Hindsight being 20/20, Moses would need these experiences as shepherd and the lessons learned in Sheep Herding 101, to survive the book of Numbers. There are experiences in the book of Numbers that I’m sure he would look back to his time with literal sheep with fondness and jealousy, wishing he could have that time back. So where are you journeying right now, at this very instant? Everyday Wes is one step closer to prennial crops with annual yield amounts…what mission are you on? Do you have a clearly defined purpose? When your feet hit the floor, do you know the direction your toes are pointed? What question are you striving to answer today? Or are you like me, living in the land of the shepherd, not knowing how long this phase will last, but hoping and praying that this learning will someday be utilized towards one goal, one purpose? Answering yes to one or the other doesn’t make you a better or worse follower of Christ? Nor does it make you closer to God? It simply shows the different parts of the journey we are on. Everyday contentment and everyday joy, I believe transitions us through the stages as we journey. What question are you striving to solve today? Posted on May 5, 2014 May 5, 2014 by Travis GailPosted in Devotional, FarmingTagged Moses, Numbers.